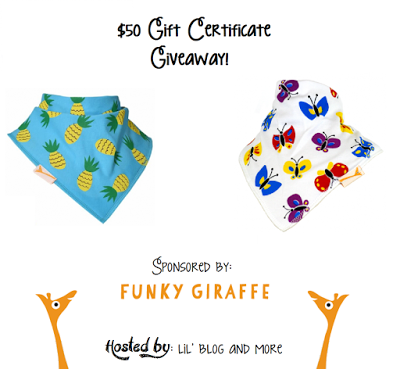 Welcome to the Funky Giraffe $50 Gift Certificate Giveaway Event! and Hosted by: Lil’ Blog and More. Funky Giraffe has graciously offered one lucky person a $50 gift certificate! Good Luck! “One thing that you’ll always use when your child is young, is a bib. It’s one thing you’ll need a lot of, and one thing you’ll want to invest in a little bit. You’ll want bibs that are going to last, and keep your little one comfortable, too. Funky Giraffe has bibs that are not only cute, but also well made, and functional. The front of Funky Giraffe bibs, are 100% cotton, and the back is fleece – The perfect pair, to keep dribble from soaking through. The back of there bibs, also feature “double poppers” so they’re also adjustable – To make them last even longer, and keep your baby comfortable. The best part about Funky Giraffe bibs? They have tons of designs, and there are new designs constantly coming out. Plus – they couldn’t be more affordable. Especially if you buy several. There bandana bibs start out at $5.50 each, and go as low as $3.85 each, when you bundle! sponsor. Must be 18 years of age or older to enter this giveaway. Next post: Flatiron Experts make it easy to have great hair! The cutie collar bibs are adorable! I like the grey and white star cutie bibs. I like the bamboo bids! I love the cutie collar bibs! Such a fun idea! I like their square bibs!